For people with physical or intellectual disabilities, the art of theatre is the powerful mode of self-expression and social inclusion that they desperately need. 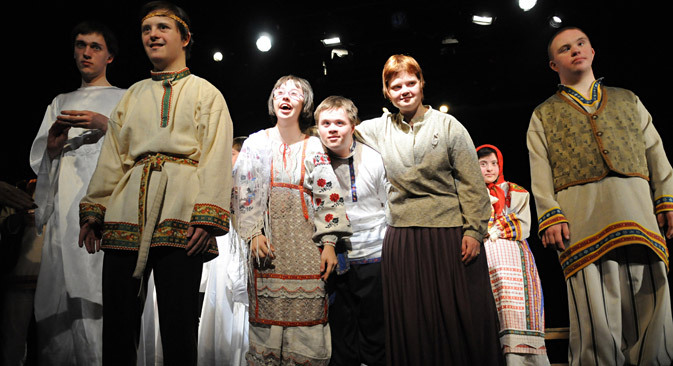 RBTH offers an overview of Russian theatrical troupes and projects for the partially disabled. The most expressive performance of Viktor Tsoi’s song “Peremen” (“Change”)—a rebellious hymn of the Russian youth of the 1980s—is done in sign-language. Dressed in black in front of a dark backdrop, a young man performs a sign-translation of the song with flawless plasticity, substantiating the words into the real world. He is Alexei Znamensky, whose performance was filmed for the closing sequence of the cult Russian movie by Sergey Loban, “Pyl’” (“Dust,” 2005). Later, Alexei starred in Loban’s next film, “Shapito Show.” Now he is a local star, and one of a few people with impaired hearing to reach such a degree of publicity. In Russia, there are over 13 million deaf people, and, for many of them, acting is an opportunity to self-express and socialize; moreover, a silent actor’s performance is, in a way, more dramatic and expressive enough to leave the spectator speechless. Sign-language comes right from the heart. The first Russian theatre troupe of deaf performers appeared in 1919 in Moscow. In the 1930s, the All-Russian Society of the Deaf organized a tour of deaf actors from Moscow to different cities of the Soviet Union. They were a huge success, with, sometimes, thousands in attendance and 20-30 percent of the audience not hearing impaired. Plays by Gorky, Gogol and Schiller were staged in complete pantomime and sign language. Only in 1948 did the first “audible” performance take place, with an announcer reading the text; this was a step to further popularize deaf theatre among audiences that were not hearing impaired. There were mainly amateur troupes until 1960, when the first deaf actors began to study at the Schukin Theatre Institute. In 1963, the Mimics and Gesture Theatre in Izmailovo, Moscow, was opened—the first professional theatre for deaf people in the world. Through the Soviet years, this theatre made numerous successful tours at home and abroad, staging over a hundred plays through the 1990s. By the 2000s the theatre, funded by the All-Russian Society of the Deaf, went into a financial decline. Now self-funded, the theatre still stages plays from the old repertoire and hopes for support and rejuvenation. The State Specialized Institute of Arts in Moscow (established 1991) is the only institution in the world that trains students with disabilities. Almost all Russian professional actors with impaired hearing have studied here, including Alexei Znamensky, who works mostly as a theatre actor. His first project, “Nedoslov,” began as an after-class studio, later developing into a working project with 16 actors and 7 plays, touring Russia, the United States and Canada. Deaf does not mean disabled: Chronicles of Deaf Theatre from Russia Beyond The Headlines on Vimeo. In Russia, there are a few more theatre troupes of actors with impaired hearing: “Indigo” in Tomsk, “Gesture” in Novosibirsk, “Slov.net” in Rostov, and the “Piano” theatre for deaf children, based in Nizhny Novgorod. Except for “Piano,” which is affiliated with a boarding school for deaf children, none of these projects have their own stage; even the Moscow-based “Cinematograph” rehearses in rented premises. The Theatre of the Open-Hearted, led by Igor Neupokoev as its founder and director, is something very different: Its actors have Down syndrome. People affected by this genetic disorder experience psychological developmentdifferently than a typical person; they need additional help socializing, but they can successfully integrate into society. Most of them have the firm intention of doing just this, even though, in Russia, 80 percent of babies with Down syndrome are still being rejected by their mothers in maternity homes. Parents who choose to stay by children born with Down syndrome need to apply all their will and patience in caring for their child. Such people can also develop genuine talent; they have distinctive personalities and a very strong will to live a life as full as everyone else’s. In Russia, even being employed with Down syndrome is an outstanding occasion. For example, Nikita Panichev, 23, has Down syndrome and works as a chef in one of Moscow’s cafes. He is also a part-time actor in the Theatre of the Open-Hearted—a place where people like him can find sympathetic company and a caring mentor. Neupokoev’s actors are people without special education. Their performances last for only an hour—they get tired fast. In every performance, the director must be present onstage: Without his advice and remarks, the actors get lost. Aesthetically, the theatre works in the field of outsider art, or “art brut,” using the naivety of actors as an artistic technique. Hence, the choice of material: Neupokoev and his actors stage plays of Gogol, Remizov and Pushkin. These are Russian classics that have a strong and straightforward message and deal with subjects of God, love, life, death, faith and other big issues familiar to everyone’s heart—and the theatre’s very existence is the proof that it is important for the actors and the audience. Like most “special” theatre projects, Neupokoev’s troupe is also self-funded and without its own stage. Still, all across the country, the sincere actors always receive the warmest welcome. The ProTeatr festival, a festival of theater involving people with disabilities opened in Moscow on Sept. 23. For more information and to see the full program, visit the web-site. The festival runs until Sept. 29.